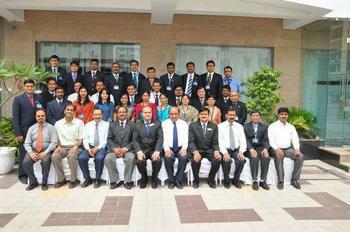 I, Rashmi Priya wanted to share my experiences from the National Train The Trainer Seminar (NTTTS) held at Hotel Peppermint, Jaipur from 19th April - 22nd April 2012. The program was hosted by JCI Kota Dynamic and the host president Kumar Vikas Jain very well resembled the chapter's name. Nice friend and a great host. I wanted to pen down my experiences so that others who are in the race to become National trainers gets benefited. The seminar started on 19th April 2012. There were total 7 participants from zone 9. We reached the venue at around 7:00 AM in the morning. We got intimated that personal interview was being conducted by the Pilot Faculty, Raman Nayyar sir and Co-Pilots Ram Mohan Gupta Sir and Firdose Kapadia Sir. I being 22nd participant got the privilege to talk to the rest of the participants before me and have an idea of the interview process. My turn came, i was feared and with a sluggish walk entered the room and greeted all the faculty members. I took my seat and the interview started. All was not well but it ended. Oh the interview ended. I was very much relived. After the Inaugural session the training session started. My mental tension lessened and i came to know the three faculties were really nice and knowledgeable people. The main concept is we should be ready to learn. unlearn and relearn. We should be ready to learn new concepts and unlearn the old concepts. The more adaptive and receptive we are the more grades we will acquire in NTTTS. Enter the seminar hall with a crystal clear mind with no preconceived notions. Preconceived notions will only add fear. The faculty team wants to see the changes in us , how much we have changed. The change should be significant and in the positive direction. Once things start flowing in the negative direction your chances of clearing NTTTS decreases. The faculty team notices each and every movement. They keep the eye on you even when you feel no one is watching and listening. The way you behave with your fellow participants, your team, other people you come in contact with and your expressions. Your body language and facial expression plays a big role in judging you as a person. Your tone, voice modulation and the genuine person in you matters a lot. Do not put on the look of an impostor and do not try to show off. I still remember the 1st day of my presentations which went very well. Then sir taught a new concept and we had to present it. I did not score well in that because i had not applied the new concept which was taught. The faculty team wants to see improvement in your every minute. They want you to follow what ever you have learned instantly. Things will get better if you obey the faculty team judiciously. Your participation in a team as well as individually matters. How you react when other participants impart presentations and how friendly you are. Never think you will pass NTTTS without doing your best. You need to give your 200% and do your best. Toil hard at night and make group and individual presentations. The faculty team can come to your room to see what you are doing and how well you are participating in your work. Remember don't try to act smart and do not try to fool the faculty team. They have got a vision which you don't have. You need to be innovative in your presentations and your approach. The more innovative you are the more grades you will accumulate. You will go through outbound training and corporate training. Outbound training is great on the fields. Keep your eyes and trainer's Antenna open (Trainer's antenna is the invisible antenna which has a long sensory organ with a far sighted vision). I still remember my outbound training activity. First was to make a longest line with 6 participants without any break. We made a long line but still it was not the longest then we opened our sandals, shoes, shoe laces to make our line the longest. Two of our team mates even opened their pants and T shirts to make the line longest. At last our line was the longest and we won in the second attempt. Second game was to fill water in a pipe with 15 holes with what ever you had. It was a funny experience. Before leaving the venue at 7:00 AM in the morning for outbound training sir gave us chewing gum and then we left the hotel for outbound training. Many of us chewed the chewing gum and threw it. But when we got the 15 holed pipe then we remembered our chewing gums. So now you got aware why i asked you people to keep your trainers antenna open. Our team closed the holes with shocks and placed the pipe on the ground. We started filling the pipe with water by carrying water in shoes, Caps and soaking T-shirts, but we noticed that water was dripping down from the bottom of the pipe. Oh God all our efforts got wasted. The pipe was then placed on the stomach of one of our team member and again we started to fill the pipe with water placed in the bucket away from the pipe. We filled the pipe till half and the time ended. In the mean while a team had filled and already won. So conclusion, an effective strategy was missing so we lost. But it was a great learning experience. Corporate training was a learning experience to do training need analysis and how to read between the lines. Sir taught us how to make Instructional objectives so that we did full justice to the training. The content was decided and delivered. It was really fun traveling to the venue and then imparting training. Our group imparted training to Tele callers. I learned how to work in team, how to handle other group members and the flow of training. 3rd day of training is still fresh in my memory. I can never ever forget that day in my life. We all were so tensed up that we did not sleep for the whole night. We all were working hard to make the group succeed. All tensed up and the whole team got nocturnal on that day. We prepared the whole night for the group presentation. Then early in the morning started marketing our training. The final presentation got completed. We all were literally feeling very sleepy. If there would have been a bed in the room we would have fought to sleep there. Then the closing ceremony and Names of final Graduation was about to be declared by Raman Nayyar sir. When sir called my name “ Rashmi Priya Yadav”, i felt so relived. I thanked Goddess Durga. God i did it. I came up to the expectations of my husband and my dad. Those 4 days of NTTTS are really hard to forget and there are few people whom i want to thank from the bottom of my heart for full cooperation. All the three faculties Raman Nayyar sir, Ram Mohan Gupta sir and Firdose Kapadia sir. My team members and friends Kumar Vikas Jain and Shetal Gonsai. Learn, learn and learn and never feel you are filled. Keep learning and keep growing.